Very similar to Dean’s Scruffy Green Coat, except that this coat has a slightly different cut on the shoulders and snaps – including two on the collar (which is the most recognizable difference between the two coats at first glance.) It can also be cinched at the waist. This is the same make and model as Dean’s S8 Blue Utility Coat. The coat first appears in Heartache (8x03), when Dean wears if for the entire episode except for when he is wearing a suit or when he is inside a motel room. In Citizen Fang (8x09), Dean wears it for the entire episode. The only time he is seen without it on is when he wakes up handcuffed to the radiator. Sam must have removed it before cuffing Dean. In As Time Goes By (8x12), Dean grabs this coat when he and Sam run out the door to chase down Henry and find him in the Impala. He only takes it off again much later, when they’re discovered who Henry is and are researching Abaddon in the motel room – when he gets in a fight with Henry about John, Dean grabs this coat as he leaves in a huff. Later, when Henry disappears to “fix everything”, Dean wears this coat when he goes to look for him. In Taxi Driver (8x19), Dean wears this coat for the entire episode, except for when he is cooking Kevin breakfast and Naomi shoes up. In Heaven Can’t Wait (9x06), Dean wears this coat when he leaves the Bunker to drive Idaho and from when he tracks Cas down at the Gas’n’Sip until the end of the episode. 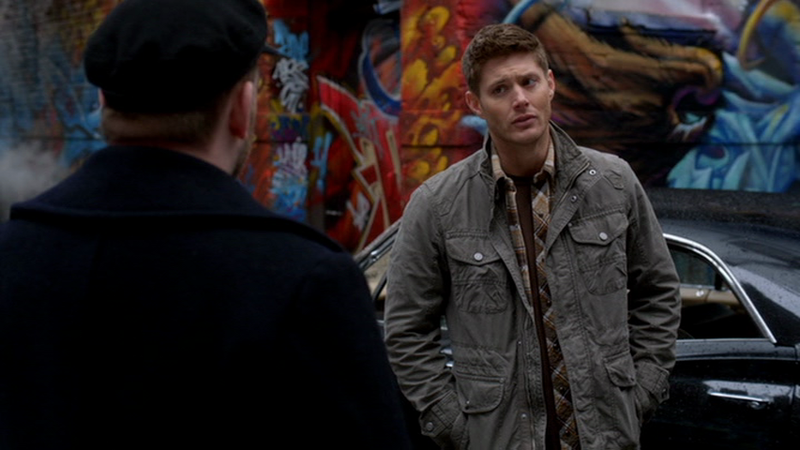 In Bloodlines (9x20), Dean wears this coat for the entire episode. In Hibbing 911 (10x08), Dean wears this coat after Donna learns about vampires and he and Sam can drop the FBI facade. He wears it until the end of the episode. In Halt & Catch Fire (10x13), Dean wears this coat when outside the bunker whenever he is not wearing a suit. In The Werther Project (10x19), Dean wears this coat when he surprises Sam by joining him on the hunt for the Werther Box. He wears the coat from that point until the end of the episode, only taking it off briefly to feed his blood to the box in order to save Sam from bleeding to death. 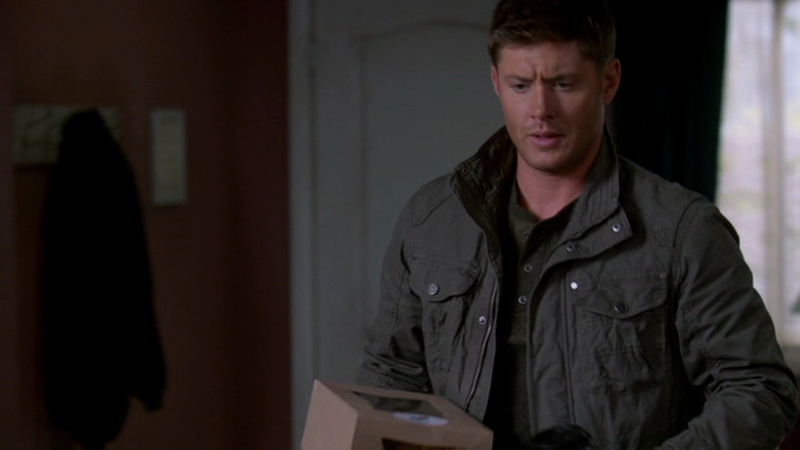 In Baby (11x04), Dean wears this coat when he and Sam leave for Oregon. He takes it off on their second night, when they’re settled into the car for the night and when he briefly wears a suit, but other than that he keeps it on for the entire episode. In The Devil in the Details (11x10), Dean wears this coat for the entire episode. In Don’t Call Me Shurley (11x20), Dean wears this coat from after the Deputy kills her husband, until the end of the episode. In All in the Family (11x21), we pick up where we left off, so Dean is still wearing this coat. He wears it until Chuck returns them to the bunker and then he takes if off before they begin talking strategy after getting over their initial questions about Chuck’s presence and previous treatment of them and the world. In Rock Never Dies (12x07), Dean wears this coat on the drive to LA, and in the hotel when they meet up with Castiel and Crowley. He then changes into a “rock musician” disguise. In The Memory Remains (12x18), Dean wears this coat when he and Sam go to check out the Sheriff’s house. He continues to wear it until the end of the episode. In All Along the Watchtower (12x23), Dean wears this coat once they leave the Bunker and keeps wearing it until the end of the episode. It's hilarious that it's from the women's line. I'd never have noticed, but now that I look carefully, I can totally see the slight bunching of fabric around the waist where a cord would have gone to cinch up the waist for a woman. "Misses Military" - bwahaha. I'm surprised it came in a size to fit a 6' Texan badass. I'm guessing they didn't tell him. I'm a 6'2" guy and I have a few clothes that are actually women's. They are more fitted, whereas men's "ruggeder" clothes tend to be really baggy. Huh. I never thought of that, but it makes perfect sense. Jensen's a really slim guy too. Neat! Very interesting that they put Jensen in a coat from the women's line. I really do like this coat. Definitely a favorite. Yeah, it looks just like his other ones, so you wouldn't really know. I mean, there's such little difference, that I'm wondering why Espirt doesn't just market their coats as unisex. They really should market them as unisex because they do look like men's coats. Where women would be willing to wear men's coats, I don't think men would even bother to look at women's coats, and these are really nice coats. Do you think they told him it was a women's coat? Pretty sure it's not an actual woman's coat he's wearing -- the snaps are on the wrong side for that. But it'd be cool to see a photo of the Esprit coat for comparison. I agree. I figure they must have just got it in a large size.